Satan's Smile by Lewis Adair - Doug Grad Literary Agency, Inc.
Acclaimed thriller writer Victor O’Reilly is back, writing as Lewis Adair. Compared to Robert Ludlum, Frederick Forsyth, Jack Higgins, Nelson DeMille, David Morrell, Ken Follet, Trevanian and Tom Clancy, O’Reilly last published in 1997 (The Devil’s Footprint). Since then, he has been doing “government work.” Enough said. This is man who knows of what he writes. Satan’s Smile—about a terrorist attack on the Lawrence Livermore nuclear lab across the bay from San Francisco—will re-launch O’Reilly (or launch Adair) back into the ranks of the thriller writers you just have to read. When FBI agent Harry Fremont is sent to Livermore, California to track down a serial killer who specializes in a method of throat-cutting known as Satan’s Smile, he is going home, in a way. For he is the son of legendary nuclear scientist Thurlow Fremont, the father of the H-Bomb along with Edward Teller. But when Harry begins to hear rumors about a sleeper cell of terrorists who are planning to attack the Livermore lab, he realizes that the serial killings must be related. Harry realizes that America’s worst fear is about to be realized—not the theft of fissionable nuclear material by terrorists—but a terrorist plan to detonate a nuclear bomb within the United States, something that could only happen if someone on the inside of the Livermore lab was also a member of the sleeper cell. 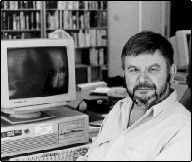 Lewis Adair is a pseudonym for Victor O’Reilly, the Irish-born author of three thrillers featuring Irish assassin Hugo Fitzduane--Games of the Hangman, Rules of the Hunt, and The Devil’s Footprint. O’Reilly is a lecturer and military consultant and lives in Virginia.